Gen Con's opening bell is about to ring, so it's time to reveal the amazing contests we're running! We're giving away wonderful swag each day -- some you have to be at the con to win, and some you can win from anywhere! For all social-media contests, you must Like us on Facebook, Follow us on Twitter, or Follow us on Instagram (whichever is applicable) to win. A few contests will be running over multiple days of the convention. We start off with Twitter. On Wednesday (before the con even begins!) and each day until Sunday, you can win a copy of I Hate Zombies! signed by designer Kevin Wilson. 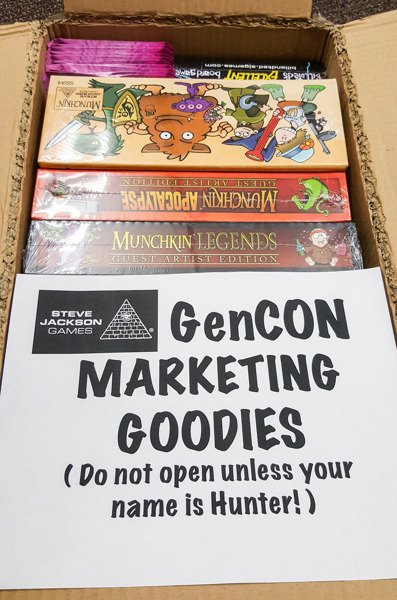 Simply reply to the #GenConZom tweet when you see it and follow the instructions. You must enter by midnight EST. On Thursday, Friday, and Saturday, you will get a chance on Facebook to win a copy of Munchkin Knights signed by the artist, Ian McGinty! Look for the #KnightyKnight post and follow the instructions each day. You can enter until midnight EST. If you're at the con, you can win a seat to #PlayMunchkin with Andrew Hackard at our booth, at 2 p.m. Thursday, Friday, and Saturday. Look for the contest tweet early each day, reply with the hashtag, and retweet. Winners will be chosen at 1 p.m. EST, and informed via Twitter. While you're at the booth, be sure to enter the physical drawing for a seat at our Munchkin Tavern guest dinner. Rub elbows with Steve Jackson, John Kovalic, Len Peralta, Lar DeSouza, and more! Enter your name and contact info at our information table at Booth #1401. Winners will be drawn at 3 p.m. each day and contacted. Speaking of the Munchkin Tavern, I'll give out a copy of the exclusive, hard-to-find Munchkin Sketch Edition each night! All you have to do is write your name on one of the Moop's Monster Mashup placemats, and I'll randomly select a winner daily at 7 p.m. EST. Winner must be present to receive the prize. With all these guests around, it would be a waste not to get some signed loot for you guys, right? So of course we'll have some epic giveaways through each of our social-media streams. On Friday, Facebook gets a shot at a Munchkin Monster Box signed by the artist, John Kovalic! 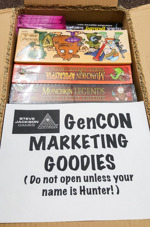 Just reply to the contest post with the hashtag #GenConMonster and follow the instructions to enter. Again, you have to enter by midnight EST. Saturday features a special contest for Twitter. You'll have a chance to win a game signed by Lar DeSouza, the artist behind the Munchkin Playmat: Spyke's Christmas Wish! The catch is that I can't even tell you what it is, because it'll be announced the night before at the Munchkin Tavern. Just remember to look for the #GuestLartist contest, reply, and retweet for your chance to win. This is another one you'll need to enter by midnight EST. Sunday we go out with a bang on Instagram with a copy of Munchkin Apocalypse Guest Artist Edition signed by Len Peralta himself! All you have to do to conquer the wasteland is find the #LenMunchkin post on Instagram, reply with the hashtag, and of course make sure you're following us. The cutoff is (you guessed it) midnight EST. That may seem like a whole lot of stuff, but there will be more. I'll be posting flash Munchkin rules on Twitter, usable for a limited time. We've also partnered with #GenCant on Twitter, so look for their contests and a chance to win a copy of Munchkin Cthulhu Guest Artist Edition. And of course I have the full might of my bag of wonders to reward gamers on social media and Gen Con attendees, so keep an eye on all of our channels and come by the booth for many chances to win!